With little national data available on graduate-level tuition elasticity, Northeastern University established metrics to identify growth areas for enrollment in certain of its advanced degrees and programs. The past decade saw strong increases in the number of potential students who could enroll for traditional undergraduate higher education. However, projections for the coming decade tell a different story. From 2015 to 2025, the number of 18- to 25-year-olds in the United States is expected to drop by 902 million, according to the U.S. Census Bureau’s 2012 National Population Projections. This decline, which is likely to be more prevalent in the Midwest and Northeast, will significantly increase competition among institutions for undergraduate students; and for many universities, undergraduate tuition revenue will decline. Many campus leaders are increasingly looking into online education and professional graduate programs as additional revenue streams. Graduate enrollment in the United States increased to 2.8 million in fall 2012, representing a 59 percent growth over fall 2000 numbers, according to the National Center for Education Statistics. As we move toward a knowledge-based economy, graduate professional and online education offers institutions the opportunity to meet the growing needs of working adults and employers for advanced education and credentials. While the opportunity is apparent, entry into this market or its expansion is not without risk. Not all institutions have successfully launched or grown online and professional graduate programs. Program development and growth needs to align with the institution’s mission, vision, and academic strengths—along with an effective strategy in place for positioning, differentiation, marketing, and enrollment management. 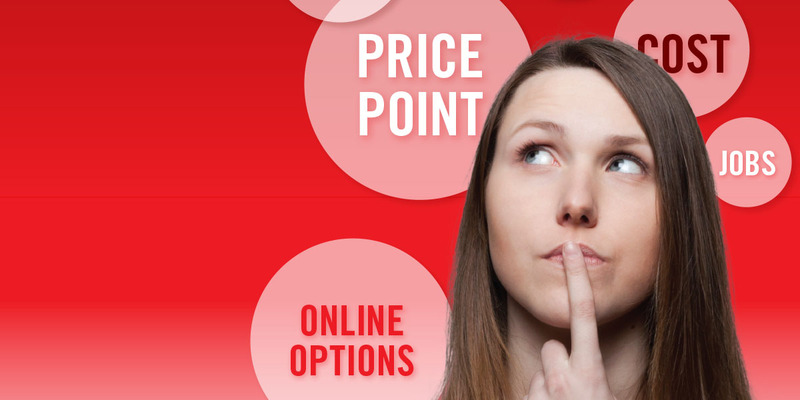 One often-overlooked area is tuition and pricing strategy. Driven by public concerns and political calls to action, universities in recent years have revisited undergraduate tuition and pricing methods. NACUBO’s annual tuition discounting study (available by selecting the “Research” tab at www.nacubo.org) has helped institutions understand market-based pricing and other dynamics at the undergraduate level. However, unlike undergraduate tuition, graduate tuition and pricing decisions are oftentimes decentralized, lacking uniformity or collaboration across various university units. Colleges and schools within the same institution often offer master’s degree programs with vastly different graduate tuition rates. Clearly, tuition rates are not uniform, and at present, only a few institutions are looking at price point with a holistic and informed strategy. This article explains why it’s critical for institutions to consider their overall graduate tuition and pricing strategy. Financial officers, enrollment managers, and other university leaders need to know: (1) the factors to take into account when appropriately pricing graduate programs and/or considering annual tuition increases; (2) the data to collect in order to best inform pricing decisions (read how Northeastern University collects data and employs a data-driven approach to guide its overall pricing strategy, on pages 21 and 23); and (3) ways in which tuition increases or changes might affect their institution’s graduate student enrollment. The market for professional graduate and online programs is sophisticated. Potential students tend to research program outcomes, rankings, price point, and a host of other factors across field-specific master’s degrees or professional doctorate programs, and online options increase the competition. Studies show that adult learners, who are acutely aware of the real cost of education and are more likely to foot the bill themselves, heavily weigh tuition in their enrollment decisions. Further, as noted in the study by Mertz, Eckman, and Strayhorn in the 2012 College Student Affairs Journal, graduate students are oftentimes more cost conscious than undergraduate students. Research also shows that outstanding undergraduate student loan debt impacts how—and if—potential graduate students consider enrollment at all, according to a 2012 study by Malcom and Dowd published in the Review of Higher Education. Student debt is certainly on the rise; and for adult learners seeking a degree, the cost of the program matters. Economic research on the impact of price elasticity on potential students underscores the importance of cost. Price elasticity in the context of higher education refers to the degree to which an institution can raise its tuition without losing student enrollments. Institutions or programs with high price elasticity will lose a high number of students, if the cost of attendance is significantly increased. Conversely, institutions with low price elasticity have the ability to raise tuition without losing enrollment. Scholarly analyses, such as those of Hemelt and Marcotte (2011) in Educational Evaluation and Policy Analysis, and Curs and Singell (2010) in the Journal of Higher Education, have consistently shown that higher education is price elastic and follows the basic laws of economics: as price increases, demand—as measured by enrollment—decreases, holding all other factors, including quality, equal. One can counter this claim by noting that overall enrollment in higher education in the United States has increased as well as the price. Researchers speculate that this may be because jobs increasingly require undergraduate and advanced degrees, which mitigates the effects of increased tuition, at least to date. Also, as discussed later in the article, the price-enrollment relationship for any given institution is complicated. Price is not the only variable that students take into account when gauging whether or not to enroll. Characteristics of the institution, its quality, the program, and the broader market—as well as the individual student—can greatly impact enrollment fluctuations that may or may not accompany tuition increases. Studies have suggested that price elasticity varies with certain institutional characteristics, student characteristics, and the competitive market. Some of the more influential variables are explained here. A competitive landscape. Studies, such as Using Student-Choice Behavior to Estimate Tuition Elasticity in Higher Education by Carter and Curry in 2011, suggest that the competitive environment closely drives price elasticity in higher education. If students feel that they have equal quality of education, but at lower cost options, they tend to choose to enroll at the institution with lower costs. Research varies on the estimated impact of competitor cost on enrollment, but a 1999 study of a private institution by Allen and Shen in the Economics of Education Review found that as net tuition was increased by 1 percent relative to another local, private competitor institution, enrollment declined by about 1 percent. So, in order to understand your institution’s price elasticity, you have to know the prices and tuition costs of other programs being offered by institutions competing for your students. Perception of quality. Price elasticity also varies by the perceived quality of the institution and program among potential students, according to several studies, including the one by Hemelt and Marcotte in Educational Evaluation and Policy Analysis. Arguably, U.S. News & World Report rankings are among some of the best measures of perceived quality nationally, regardless of whether you agree with the rankings’ principles and methodology. Studies have repeatedly shown that higher U.S. News & World Report rankings are associated with decreased price elasticity and vice versa. Students will pay more to enroll in programs that they believe are of higher quality. The level of price elasticity or inelasticity at your institution may be related to its position in the rankings. The top 25 institutions ranked by U.S. News are relatively price inelastic, say Buss, Parker, and Rivenburg in their 2004 study in the Economics of Education Review. For these “elite” institutions, tuition increases will not likely impact student enrollment numbers. According to Hemelt and Marcotte, the top 120 institutions ranked by U.S. News exhibit relatively lower price elasticity than other institutions, meaning that they could still see small to moderate student enrollment declines as a result of significant tuition hikes. Institutions that are not ranked, or fall outside of the top 120 list, have relatively higher price elasticity, and their potential student base is more likely to be cost conscious and price sensitive. Minority students and underrepresented groups in higher education. Studies have consistently shown that students from groups underrepresented in higher education tend to be price-sensitive, and are more likely to be deterred from both applying and enrolling in an institution with increased price of attendance. Findings from several studies suggest that students from underrepresented groups may perceive and respond to the price of higher education differently, including students from minority groups such as Hispanics, African Americans, and Asians; low-income households; or children of parents with lower education levels. The price sensitivity differences are fairly significant. For example, one study found that a $1,000 decrease in net cost equated to a 6 percent increase in enrollment yield among White students; however, the same decrease in net cost led to an increase of 10 percent in enrollment yield among African American students. Institutions that serve greater numbers of students from underrepresented groups are more likely to experience higher price elasticity, and thus, see greater enrollment declines resulting from increased tuition and cost. While these trends are generally concerning to any institution, they are also particularly relevant to those institutions seeking to increase graduate student enrollment. Individuals from racial/ethnic groups with higher demonstrated price sensitivity comprise a growing portion of the potential graduate student audience over time. While the percentage of White graduate students declined from 2000–12, the percentage of Hispanic, African American, and Asian graduate students increased rapidly during that time. If an institution is seeking to significantly grow graduate enrollments, the price sensitivity of these student audiences—which make up about a quarter of all graduate enrollments and are rapidly growing—must be taken into account. So, what about financial aid? How do grants and scholarships fit into this equation? Studies are somewhat conflicting on this topic; some research has shown that grant/scholarship aid does not mitigate the negative enrollment impact related to increased price point, while other studies have shown that it does. The answer may vary for any given institution. A student’s decision could be affected by the institution’s perceived quality, student audience, and other relevant factors. The current body of research suggests that list price does, in fact, impact volume of applications. This is particularly true among underrepresented student groups in higher education, and especially true for institutions ranked below the top 120 institutions by U.S. News. As noted above, studies focusing on underrepresented student groups show that these students are dissuaded from applying to a program if the list price is high, and the impact of increased aid may not be enough to mitigate the negative impact of the high list price. A 2014 study by Porter, Yang, Hwang, McMaken, and Rorison in the Journal of Research on Educational Effectiveness explored the relationships between merit-based aid and matriculation among students accepted into an elite university’s master of education program, which is primarily full time and on campus. At this university, the most academically qualified students were randomly offered either $10,000 or $18,500 in merit aid ($18,500 equaled roughly one-third of the tuition cost). Despite the significant difference in aid offered, no difference in yield/matriculation rate was observed. These findings generally align with data suggesting that highly ranked universities have lower price elasticity, and student enrollment will not likely be influenced by increased cost of attendance. These trends shed light on the general effectiveness of the high list price/high-aid enrollment strategy versus the low list price/limited- or no-aid enrollment strategy, in particular for graduate professional programs. For these programs, we know that the student audience is cost conscious, and oftentimes, carries existing undergraduate student loan debt. Whether the high list price/high-aid strategy (or increased financial aid in response to tuition hikes) is the best choice for your institution may depend ultimately on your overall enrollment strategy and your audience of potential students. If an institution’s audience consists largely of domestic students, a significant portion of which are from underrepresented groups, then increased financial aid may not mitigate the negative enrollment impact of increased list price, likely leading to a decreased student intake. If an institution’s student audience is primarily White, middle- or upper-class students and/or international students, then increased financial aid may be sufficient to continue to sustain and grow enrollment, should the institution increase both price and financial aid. Demographics of your student population. What percent of your students is from underrepresented groups? Is this percentage higher for certain graduate programs? Tuition and fees sticker price of competitor programs and institutions. Indicators of perceived student reputation. 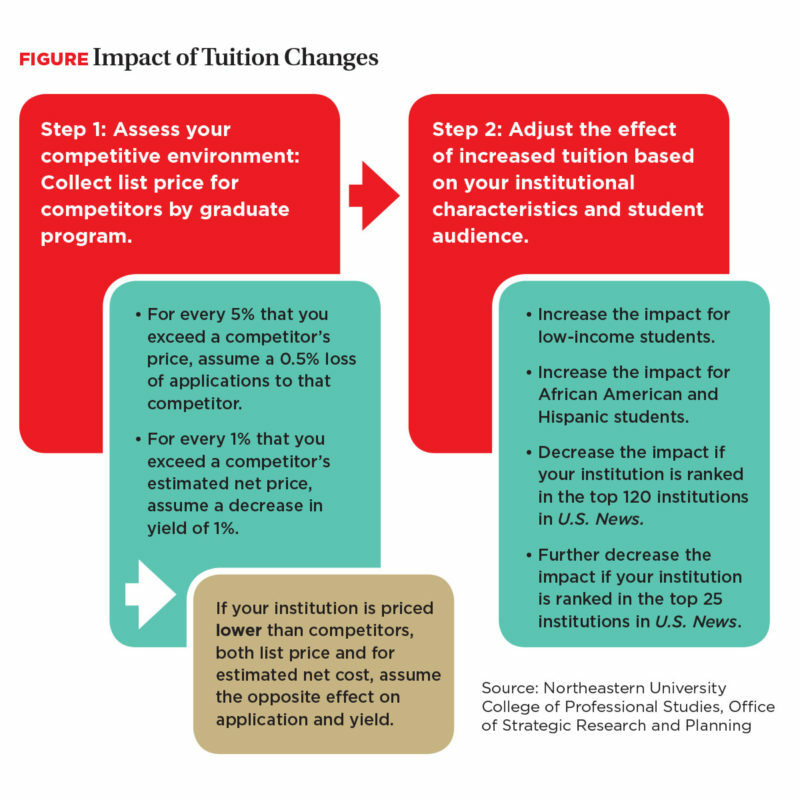 Several years ago, senior leaders at the College of Professional Studies (CPS), Northeastern University, Boston, began to think critically about tuition and pricing across its portfolio of academic programs. They decided to invest time and effort into building a data-based, research-informed process that could guide overall pricing strategy, as well as any necessary tuition increases in the future. CPS currently offers 17 professional master’s degree programs and a professional doctorate that are aligned with various industries and occupations. In addition, the college also offers numerous graduate programs in education as well as a Doctor of Education program. Most programs are offered online, although many are campus-based to best serve the growing population of international students. CPS has developed and implemented a process that involves the annual collection of numerous data points. An accompanying analysis and report are completed at the close of each calendar year. This research serves to inform tuition decisions for the forthcoming fiscal year, and its completion is timed concurrently with CPS’s annual budget planning process. The college’s director of strategic research and planning leads the process along with support from one additional full-time staff member within the unit, as well as external contractors who collect data as needed. In addition to the data points outlined in the table, “Pricing Analysis: The CPS Process,” below, CPS also monitors student demographic changes through its Office of Enrollment Research and Strategy. Data on past list price and tuition increases across competitor programs and at peer or competitor universities have provided useful benchmarks and insight for the CPS finance and business planning team. Competitor data by program provide a useful illustration of CPS’s relative list price within the broader market. Data also identify the programs that may be at an increased risk for enrollment loss if price increases are implemented. Data demonstrating financial return on investment for various professional graduate programs shed light on areas where there could be lower price elasticity among students, given higher anticipated returns upon graduation. Data are often aligned with overall demand for a given program of study, though not always. The overall goal of this process is to ensure that CPS programs are offered with pricing that is competitive in the marketplace; that is aligned with graduate student needs; and that promotes the scalability and sustainability of the college’s business model. In the future, CPS will continue to conduct this annual analysis. As data become richer over time, programmatic tuition and enrollment numbers could be analyzed in more sophisticated ways. It could be possible to estimate for example, the price elasticity among potential students for any given program by conducting regression analyses using tuition and enrollment data. Regardless, even at this point, the data points and the process outlined here offer important insights into each programmatic market—something that both faculty leads and administrative staff have found valuable. Outside of the top tier of the most selective and “elite” institutions, price is important, both for student application and matriculation. Some studies show that price is the most important criterion for adult learners, while others show that it is among the top considerations behind perceived programmatic quality. Financial considerations are more complex for adult students considering graduate enrollment, relative to the traditional undergraduate student. Institutions that want to grow graduate enrollments in professional programs need a solid strategy around tuition and pricing. Knowledge of the competitive enviro-nment is critical in building your institution’s strategic pricing strategy. Institutions should systematically collect and monitor pricing data for local and national competitors offering similar programs. This is lengthy and time-consuming, but a critical task. For professional graduate programs, institutions should collect data by field of study because each individual program presents a unique market. Review data for competitor programs that use similar delivery modes (online, on-campus, etc. ), draw from a similar student audience, and are ranked similarly. The competitive landscape will look different for each institution and for each graduate program. An analytical model (see figure, “Impact of Tuition Changes”) can be used to understand the impact of tuition changes on enrollment and revenue. This model is research-informed and based on the studies mentioned throughout this article, as well as other related economic studies. We are only beginning to understand these dynamics, but it is clear that enrollment decisions for adult students are more complicated and financially dependent than comparable decisions made by traditional undergraduate students. This model has been useful for the College of Professional Studies in ensuring that we are making tuition decisions in an informed manner. We hope that this information will support others in making equally thoughtful and data-driven choices. MINDY ANASTASIA is director, strategic research and planning, College of Professional Studies, Northeastern University, Boston. Students will pay more to enroll in programs that they believe are of higher quality. Tuition and list price of competitor programs and institutions. The 2014 NACUBO Tuition Discounting Study, which measures changes in enrollment, discount rate, and net tuition revenue at private colleges and universities, will be released in August 2015. This year’s study was sponsored by Hardwick Day, a division of Royall & Co., that offers customized services to higher education institutions. The study also collects data on (1) the number of grant recipients, (2) amount of tuition and fee revenue, (3) percent of grants funded by endowment earnings, (4) breakdown of need and merit grants, and (5) perceived reasons for enrollment loss or gain. It delivers metrics such as enrollment trends, percentage of students receiving an institutional grant, the percentage of tuition and fees that the average grant covers, and the average annual change in net tuition revenue. Data for the 2014 study were gathered electronically using Web-based survey software. U.S.-based NACUBO members at private (independent), four-year institutions with undergraduate degree programs and valid e-mail addresses as of September 2014, were invited to participate. Roughly 44 percent of the 927 members submitted usable responses. The 412 participants represent 55 comprehensive/doctoral institutions, 33 research institutions, and 324 small institutions. Tuition discount rates are defined as the percentage of an institution’s total grant aid awarded to freshmen (or other particular groups) as a percentage of gross tuition and fee revenue from freshmen. They explain what portion of the institution’s gross tuition and fee revenue is given back to students in the form of scholarships, fellowships, and grants. The survey components that make up this calculation are total dollars of institutional grant aid awarded to freshmen, the number of freshmen, and the institution’s sticker price. Participants will automatically receive a complimentary copy of the report in early August. The 2014 report is priced at $200 for members and $750 for nonmembers. For more information, visit www.nacubo.org.